First things first, on this last day of October: Yay Red Sox!! It’s only too bad that the weather outside is not in tune with the festive celebrations we should be having today. The weather is cooperating, though, with the recipe I’m going to post. 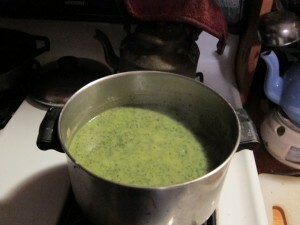 Damp, chilly weather makes soup almost an imperative. 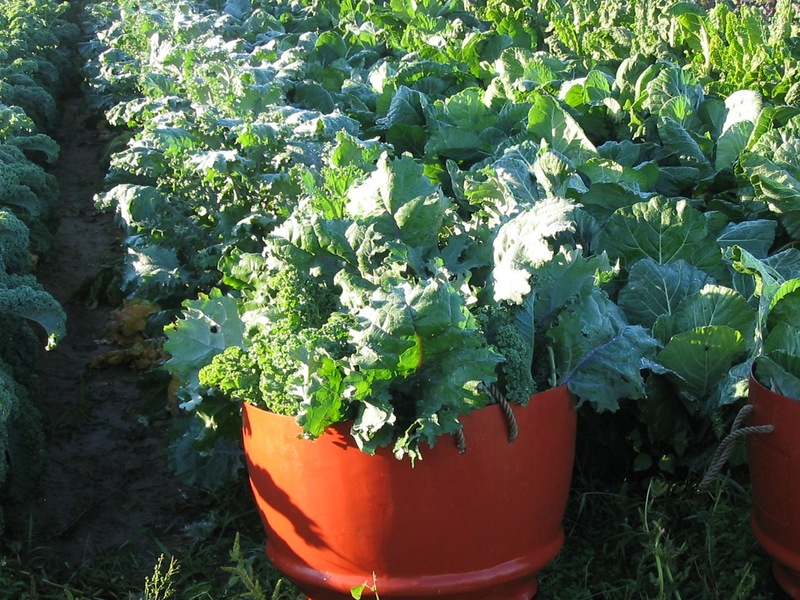 Kale is one of the stalwarts of the Hampshire CSA. 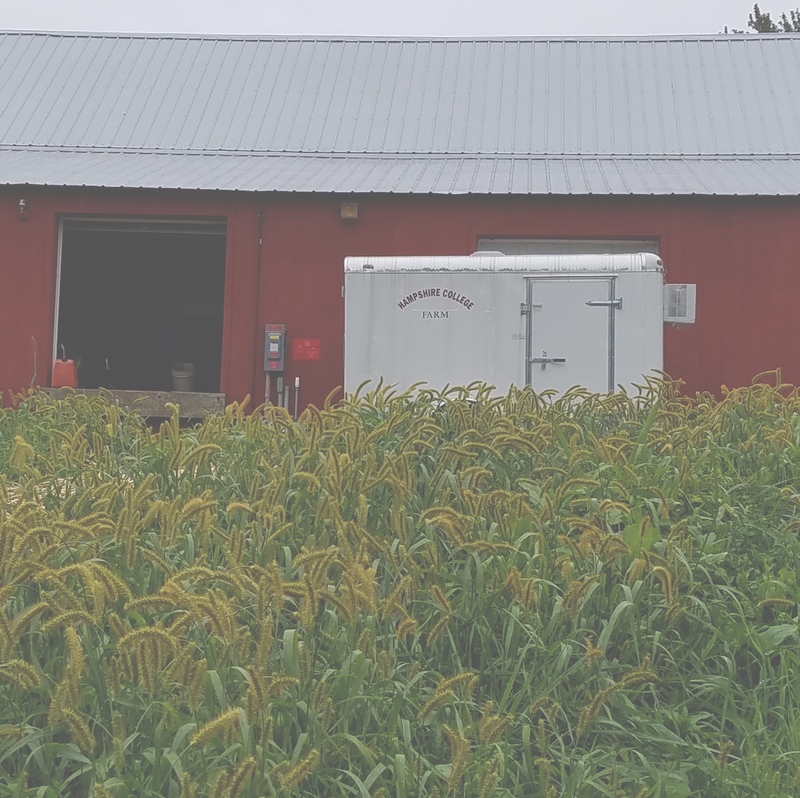 It’s there in September, along with its sexier summer companions, tomatoes and peppers and eggplant, and it’s still there in November, along with the sturdy root vegetables, the rutabagas and beets and turnips. Over the course of those months, the kale is sometimes Red Russian, sometimes Winterbor, sometimes Redbor. It is always fantastically good for you. Kale itself used to be in that less glamorous category of vegetable until a few years ago when it became hip. Just a few weeks ago, the New York Times magazine ran a piece on “Who Made That Kale?”, which traces the increase in kale’s popularity over the last few decades. (And in September, there was the article about why kale still isn’t that popular in France–though that will change if the “kale crusader” has her way.) According to Drew Ramsey, described as “a psychiatrist at Columbia University and a kale evangelist,” the “nutrients in kale help to make us feel optimistic and ward off depression.” As a way to improve America’s mental health through increased consumption of kale, he declared October 2 National Kale Day (unfortunately not yet officially recognized by Congress, but there’s always hoping). We missed celebrating National Kale Day at Hampshire, but that doesn’t mean that kale is not being celebrated (and cooked and eaten) in kitchens all over campus every week. One of my favorite things to do with kale is to use it to make an easy and delicious soup, a riff, really, on leek and potato soup. Except that this version has kale in it, of course, and smoked paprika, which elevates it beyond the mundane. 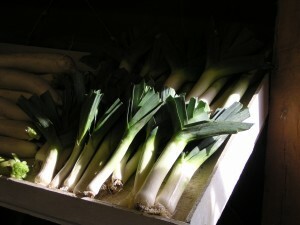 It’s also an opportunity to use some of the gorgeous CSA leeks that are available right now. The soup is also a vegetarian version of the Portuguese soup called caldo verde (green broth) which has kale and potatoes in it. Traditional caldo verde also includes large quantities of pork sausage. To replicate some of that smoky flavor without the meat, I opted to use smoked paprika, which really makes the soup. I’ve made this soup often in the past few years, and it’s almost certainly true that I’ve never made it exactly the same way twice. That’s actually one of the great things about it–you can be flexible with the ingredients, and the soup will still be delicious. As long as there is some kind of allium (onion, leek, shallot), some kind of potato, garlic, kale and smoked paprika, you will end up with delicious–and deliciously healthy–soup. If you have slightly more potatoes or slightly more kale, it doesn’t really matter. I’ve also made it with multiple kinds of kale, and it’s still always good, so use whatever kale you have on hand. You basically start as if you’re making leek and potato soup, by sauteing leeks (and/or onions and/or shallots) in a bit of butter. I usually put my first hit of smoked paprika in with the leeks or onions. Then, you add diced, peeled potatoes and mix everything up. Once the potatoes have had a few minutes to mix and meld with the leeks/onions, you add water. Meanwhile, you’re dealing with the kale, washing it, cutting out the tough stems and chopping it thinly. 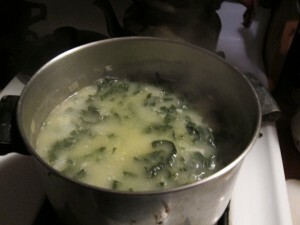 Then, you add the kale to the soup and let it cook down. Once the potatoes and kale are both soft, you’re basically done. I like my kale and potato soup pureed, so at that point, I use my handy immersion blender and whirl it all up until it’s a nice shade of green. Whether you make this soup with the dairy or not, with red kale or green, curly or plain, what you end up with is smoky, savory and entirely satisfying. It’s almost November and longer nights are upon us now. Some soup on the stove is one way to help ward off the darkness. 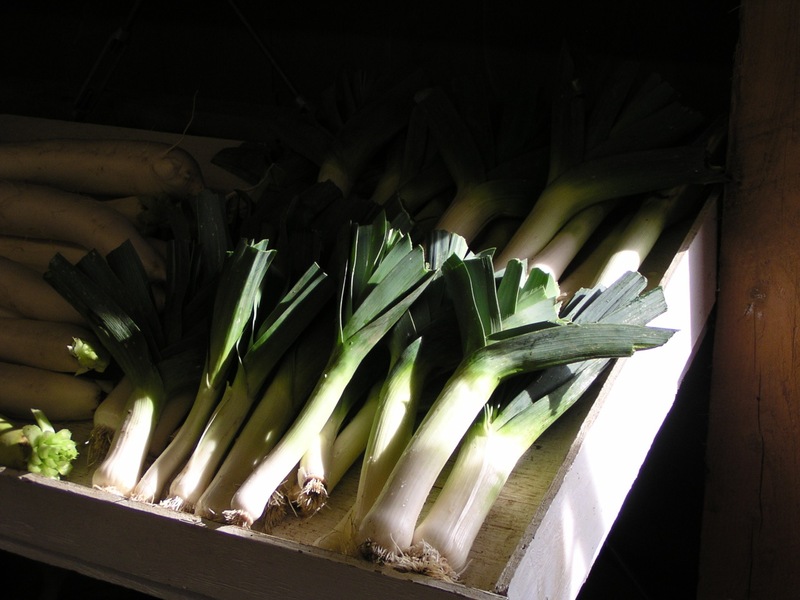 In a large soup pot, saute the white part of the leeks (and/or the onions or shallots) in the butter until soft but not brown. Once the leeks are soft, add the garlic and continue to stir. Add 1 tsp. smoked paprika to the leeks and garlic and stir until coated. Meanwhile, while leeks are cooking, peel and dice the potatoes. Add to the leeks and garlic and cook for several minutes. If anything starts to stick, you can add a bit of water now. Add approx. 2 quarts of water. 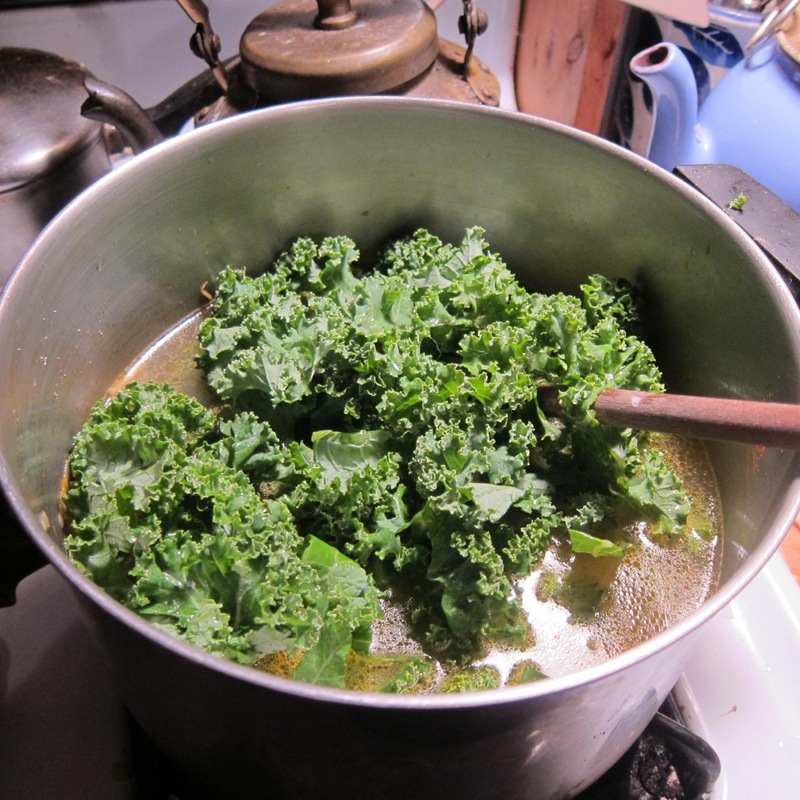 Take out the tough ribs of the kale and chop the kale leaves finely, (I usually do it in ribbons, even if I’m pureeing the soup.) and add the kale to the soup. Cook for approximately 20 minutes or as long as it takes for the potatoes to be soft (they should break up when you mash them against the edge of the pot). Puree the soup with an immersion blender or transfer it carefully to a blender or food processor and then return it to the pot. Salt to taste, ideally with Maldon salt, and season with additional smoked paprika to taste. (Optional) Add several tablespoons of half and half (I never usually measure but use just a splash from the carton). Eat more kale and enjoy! 15 Kale recipes all in one place! Your soup looks delicious too! Will it work without the bacon? One of my friends admitted that she got her children to eat the kale soup by crumbling bacon on it, so that’s always an option! Thanks! It came out great, which is why I bothered to write up a recipe so I can replicate it. It’ll definitely work without the bacon, I would just use a little more salt and maybe some smoked paprika. I made this soup, using chicken stock, in place of the water. And, the kale I had was purple. My kids loved the soup–especially my younger daughter, who lives for a good soup–particularly when it was purple-hued. Even the slightly spicy smokiness of the (hot) smoked paprika was a hit. Of course, the next day, it was a bit more, uh, earthy in color. Nonetheless, it was delicious, and we were a wonderfully cheerful household for days! I made this with rutabaga instead of potatoes – it still came out great! I definitely added more paprika, and added some black beans. I also put some cloves in the left overs – also awesome! I’ll have to make the soup with potatoes and compare.